Zestos: Enabling life through communication of research: As an adult you can make more brain cells ! Popular belief was that once your brain had finished it growth in the womb you didn't grow any more brain cells. Very recently this belief and was proved to be inaccurate. The great news is that you can grow more brain cells as an adult. This process unsurprisingly called Neurogenesis - the birth of neurons. Dentate gyrus. This section of the brain is part of the hippocampus. 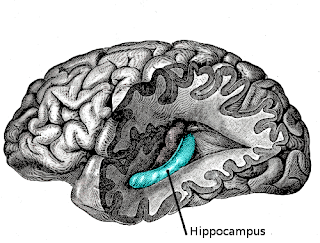 The hippocampus is show n as the blue section of the graphic. 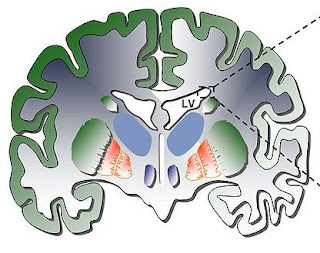 The dentate gyrus is involved in memory formation and the formation of new memories. Damage to this part of the brain can create Déjà vu. Interestingly enough stress and depression can inhibit the neurogenesis that occurs. It is known when you are stressed about an examination you struggle to memorize material. I wonder if this is the explanation. Also antidepressants helps increase the neurogenesis in this area. Preliminary studies have indicated that exercise can increase the neurogenesis in this area. I also find that when I go for a run my memories of the run can be very vivid, especially when I see or experience something new or unusual. I often have strong positive memories about how wonderful creation really is. Preliminary studies also indicate that poor glucose control (diabetes) can impair neurogenesis. This might explain things like alzheimer's are high in the high sugar western diet. Also kids learning is difficult when they have taken in sugar. I wonder if it is due to the shut down of this neurogenesis. I have found it much easier to understand things when I have not had sugary food. When I am intensely focused on grappling with information I will avoid all sugar as this messes up with the understanding. Fluid creating/circulateing cells. These cycles circulate the fluid in which the brain sits, acting like a cushion holding and protecting the brain. Another type of cell is created. It is thought that they migrate to the olfactory bulb which is the part of the brain that deals with smell. However evidence is conflicting on this. "Type B" cell, which does stuff that is still be figured out (it's over my head), could be associated with brain repair. It doesn't really surprise me that brain cells are made, because so many people peice their lives back togeather after a brain/head injury. People who are written off by the doctors come back to lead normal lives.